We started carving our pumpkin the other day and created this cozy fairy garden out of it, inspired by this pumpkin diorama. First we cut the top - the girls were delighted by the sight of all the stringy, seedy insides! 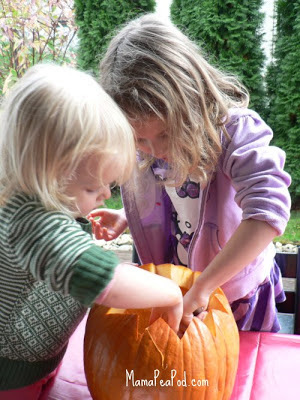 It took some convincing, but I finally managed to get the girls involved in scooping out the insides (granted, they were a bit cold inside since the pumpkin had been sitting outdoors). Princess Pea isn't really a fan of slime, so she used a spoon and bowed out at the first possible escape window, but once Sweet Pea got started, she really enjoyed the sensory experience and helped me sort through the goop to collect all the seeds for roasting. I cut a huge 'door' in the front (which fits back on), and we gathered bits and pieces from the garden and house to create this comfy spot for a fairy to sit and reflect. We had found this 'fairy chair' piece of wood in the forest a couple of weeks ago and brought it home for our outdoor fairy garden. We added a few sprigs of lavender, some bark chips, and painted pebbles and snail shells from around the garden. Then we added a fake flower, a plastic salamander, a small wooden apple, a felted owl, and, of course, a fairy. I think it's really sweet, and the girls are quite taken by it! We have it set up on the upstairs balcony, facing in towards the window so it can be seen from indoors as well as played with outdoors under the cover of the balcony roof. I think it's not how we'll use it on Halloween night, as we'll need light in it, but it's a fun way to use it for now. When Halloween comes, I'll fit the door back on, and either carve a face in the other side, or perhaps drill some holes to make a lovely luminary like the one Taming the Goblin made. 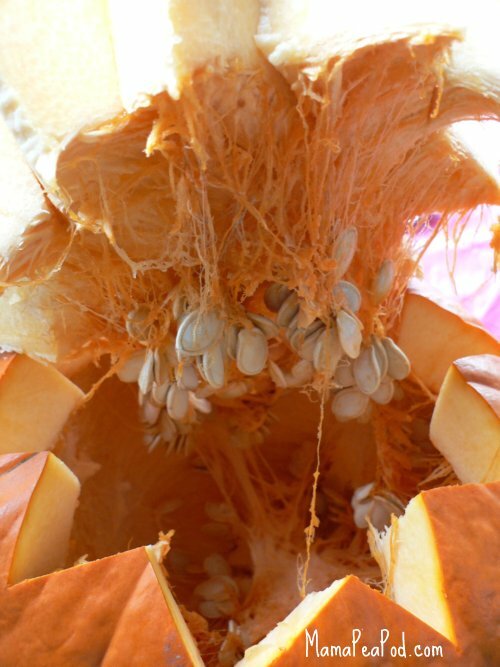 What did you do with your pumpkin this year? You might also like to see our 'mummykin' pumpkin from last year, or see more pumpkin ideas here. And there are lots more seasonal ideas on my Halloween and Fall pin board.